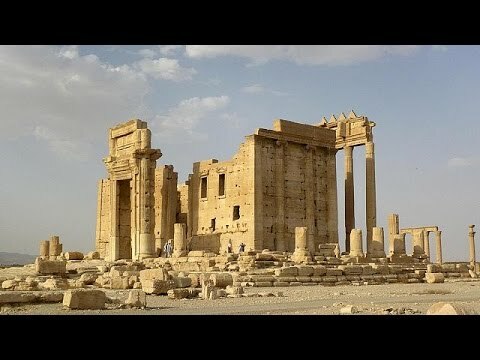 A second ancient temple at Palmyra has been razed, with a satellite image appearing to confirm the destruction of the Temple of Bel, previously one of the best-preserved parts of the ancient city. The revelation follows the release of images by Islamic State last week showing the Baalshamin temple had been blown up. IS militants seized control of Palmyra in May, sparking fears for the 2,000-year-old World Heritage site. Ancient ruins are not all that has been lost. Khaled al-Asaad, the 81-year old former director of the world-renowned archaeological site at Palmyra in Syria, was beheaded in August. His body was hung on a street corner by Islamic State for everyone to see. Prior to his death, al-Asaad and his son Walid, the current director of antiquities, had been detained for a month. They had been tortured as their captors tried to extract information about where treasures were to be found. Al-Asaad had worked at the archaeological site for more than 50 years, spending most of that time as its director. He never really retired and was always very active, sensing that he had a kind of mission in Palmyra, the ancient city to which he had devoted his life. He was interested in archaeology from a very young age, even though it was a relatively new field in Syria at the time. When France took on its post-World War I mandate as administrator of Syria, Palmyra was a road junction between Homs and Deir ez Zor – a well-known stop where the Zenobia Hotel, run by a French intelligence officer, welcomed travellers who were in transit between the Euphrates, Homs and Damascus. There was French airfield in the region and a squadron of French troops was stationed there. The garrison chaplain, Jean Starcky, was so interested in the monuments of the site and in the Palmyran inscriptions that he became a world expert on them. It was he who published the first archaeological guide of Palmyra. In 1930, Henri Seyrig, a young scholar who had been appointed director of antiquities in Syria the year before, had organised for the people who lived in the ruins of Palmyra [E. Will, Comptes rendus des séances de l’Académie des Inscriptions et Belles-Lettres (CRAI) 1993 N° 2 pp. 384-394, cf p. 387] to relocate to a new city to the north of the site – the current Palmyra. Seyrig then organised the archaeological dig of the Temple of Bel with fellow archeologist Robert du Mesnil du Buisson, who worked on the site and then led the dig at the Temple of Baalchamin. But when France’s mandate ended on April 17 1946, the French soldiers departed. The scientists went with them. At that time, Khaled al-Asaad was studying in Homs. In 1960, he enrolled to study history at the University of Damascus. With his degree in his pocket, he became a civil servant at the Directorate General of Antiquities and Museums in Damascus. Then, in 1963, the young al-Asaad was named as chief curator of the new museum in Palmyra and director of the site. His numerous excavations in Palmyra included temples and religious monuments, but also living quarters and tombs. He cleared some parts of the stone and marble fortifications that had been constructed at the time of the Roman emperor Diocletian around the monumental centre of the city. More recently, he excavated and restored the main street after evidencing the ancient paving buried under soil and a tangled network of pipes. Khaled al-Asaad had an archeologist’s sense of responsibility and his excavations have always been followed by effective, discreet and smart restorations. He also wanted to bring Palmyran civilisation to the general public and sought to make the site welcoming for visitors. But he was, above all, a scientist. Since the first year of his appointment to the Department of Antiquities, he began publishing a number of books on the history of Palmyra and its surrounding region. He wrote a guide to ancient Palmyra and a book about the famous queen Zenobia. He helped organise exhibitions on palmyran antiques, the first of which took place at the Petit Palais in Paris in 1974. Khaled al-Asaad had an open mind and always actively supported French missions in Palmyra, as well as those lead from Germany, Poland, Japan and Switzerland. He recently collaborated with a mission of the German Institute of Damascus in a geomagnetic exploration south of the torrent valley of Palmyra. This led to the discovery of a major residential area that nobody knew existed. Until the end, he remained approachable to everyone. This is especially true of the workers in Palmyra, who appreciated and respected him deeply because they recognised in him a generosity above and beyond what was required by his job. Even after his notional retirement, Khaled al-Asaad remained a valuable expert. He remarkably read the Palmyran language and knew a remarkable amount about Palmyran civilisation. The directorate always consulted him when police discovered stolen statues to appraise. Upon hearing of his death, Maamoun Abdel-Karim, director general of antiquities and Museums of Syria, said IS had “executed one of the foremost experts of the ancient world”. Among the five reasons given to justify his execution, Khaled al-Asaad was also accused of being a supporter of the Syrian regime. Like nearly all the leaders and employees of the Syrian archaeology sector, Khaled al-Asaad was keen to remain at his post. In doing so, he did not see himself as being at the service of the Syrian regime, but at the service of his country. And in Syria, where patriotism is perennial, being at the service of the state is not an empty sentiment. His courage was fatal to him. He died a hero and a martyr.